Rosa Carhuallanqui was born in Huancayo Peru. In 1986 she studied anthropology at the National University of Central Peru. In 1996, with her thesis project "the Dances of the Llamichos and its historical and Pedagigical implications" Rosa obtained her teaching degree, specializing in Marinera Nortena and Folkloric Dances from the National School of Folklore "Jose Maria Arguedas". In 1997 Rosa is hired by the Ministry of Education as part of a mayor pilot project (Decree 0614) to include folklore in its educational system. In 1998, Rosa publishes her book "Pastores de Altura, Magia, Ritos y Danzas". Rosa was recognized in 2005 by el Diario La Prensa of New York as one of its Outstanding Latino Women of the Year for her work on behalf of education. 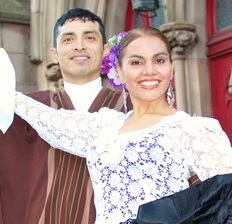 Rosa is the founder of Peruincafolk Company which presents the dances of Peru’s coast, mountains and amazon. Rosa was an Instructor and artistic director of Pachamama Peruvian arts. She gives free classes of traditional Peruvian music and dance offered to children by the Center for traditional Music and Dance in NEW YORK. She is specialist in Marinera Norteña and introduced the dance amidst of other styles of dancing from the world like, Irish dance, tango, salsa, flamenco in the competitive entertainment world of new. Also she has introduced Peruvian dance in North American education system of New York, New Jersey and Connecticut through their programs of art and dance. In 2013 she was recognized for Community Works NY honored heroes of the 2012-1013 making a difference in after school programs.